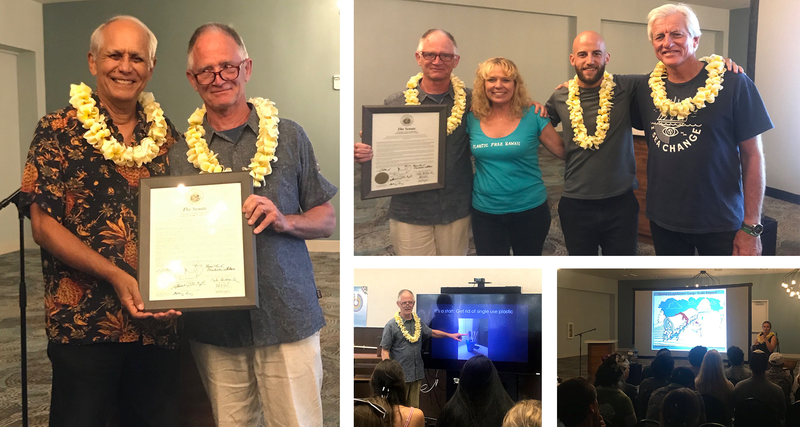 In March, our Plastic Free Hawaiʻi program hosted two events with Dr. Pete Myers, an expert on the health and environmental impacts of plastics. Dr. Myers is Founder and Chief Scientist for Environmental Health Sciences, a nonprofit organization dedicated to driving science into public discussion and policy on environmental health issues, including climate change. The first event was a presentation on how plastics impact our health to AP Biology and Environmental Science students at Punahou School. The second event was a screening of the film The Smog of the Sea followed by a panel and Q&A with Dr. Myers, Paul Lecompte of The Swim, and Mark Cunningham, who was part of the voyage documented in the film. Jennifer Milholen, Kōkua Hawaiʻi Foundation’s Waste Reduction 3Rs Coordinator also presented on how audience members can get involved with current legislative initiatives in Hawaiʻi aimed at reducing single-use plastics. We thank the panelists as well as representatives from Surfrider Foundation, Sustainable Coastlines Hawaiʻi for attending and the Queen Kapiʻolani Hotel for hosting this event!